One of the truly remarkable things about Amazon as a platform is that they do so much of the heavy lifting. What with being the world’s largest ecommerce storefront, Amazon brings droves of traffic to your listing. What’s more, that traffic is a pool of buyers, ready to purchase, unlike anything else the world has ever seen. While eyeballs on Google often equate to browsers and researchers, Amazon attracts buyers. A good conversion rate on an Amazon product detail page is widely considered 15%. That’s a huge number, often 3-5x that of other ecommerce sites. This is because Amazon product page traffic is already in the purchasing mindset. 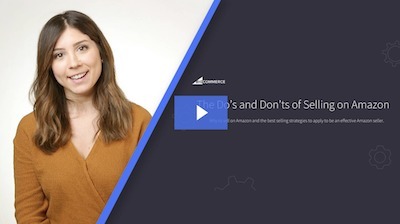 Of course, to make the most of the traffic Amazon drives to your product page, you must make sure that your listing is properly optimized — for search and Amazon marketing best practices. Here are the most critical elements of maximizing conversions on your Amazon listing. I’ve included some updates here regarding the now lower 250 character indexing limit for backend search terms. This update occurred in late summer 2017. There are also sections in this chapter about the new Enhanced Brand Content for product descriptions for all brands – which is currently free. One of the two most essential elements of an Amazon product detail page is its title. A title tells people what your product is about. While Amazon wants your title to be short, descriptive and to the point, they do allow for between 150-250 characters. So, there is plenty of room to throw in some keywords to help your product rank for terms buyers often use when searching for your type of product. to inject a few of the best possible keywords for your product. to educate customers more about your product, before even coming to your product page. It is important not to cram your title so full of keywords that it doesn’t make sense. It should be easily readable, and shoppers should be able to tell what your product is immediately. You can use tools such as Merchant Words, Google Keyword Planner and Simple Keyword Inspector to find relevant keywords for your product type and to estimate search volume. You can also begin typing in a keyword in Amazon’s search bar, and look at the results that populate below as ‘recommended’ search terms. This is called Amazon’s A9 algorithm, and it is based on the most popular related terms. Another critical area of importance on an Amazon product details page are images. Images, perhaps more than anything else, can cause a shopper to either click on your listing or to keep scrolling. To capture buyer interest and land them on your product page (where there is a 15% conversion rate! ), spend the time and effort to use high-quality images for your product. If you have an independent online store, you can use images that work well there. But, Amazon does have a few of its own rules. Amazon requires that the main image for your product include only the product that you are selling, on a white background. This allows for the search results on Amazon to appear clear, uncluttered and uniform. Amazon tests everything, and they determined in the early days of their existence that visitors to their site bought more — much more – when products were displayed against a plain white background. Main images should not include accessories that are not included in the purchase, models or action shots of the image, nor text or badges such as ‘Organic’ or ‘Made in the USA’. Once a shopper is on your product page, images are even more critical, and can often be a determining factor as to whether someone purchases your product or not. Make an effort to use all of the product images offered, and don’t use inferior images just to fill up all allowed spaces. While your main image is required to be against a plain, white background, Amazon allows for other image types on secondary images. Your product from different angles (side, top, close up). The back of a product label. Images of your product in action. Images that list your product’s features or compare it against other products. Informational images with text/charts, etc. Images that show your product’s size as compared to a human holding it. Amazon requires that images be a minimum of 1,000 pixels x 1,000 pixels to take advantage of its zoom feature, which allows buyers to scroll over an image to enlarge it. This is a popular feature with Amazon buyers, so take advantage of it. If you can, use images that are 2,000 pixels x 2,000 pixels, for added granularity. My favorite resource for high-quality, affordable images is iStock. Once your listing is live, you should test your image placement to see which images elicit the highest conversion rate for your product. To do this, track your total sessions, number of sales, conversion rate (unit session percentage) and total revenue over the course of a week, then change the order of your images, and measure the same data over the next week. You may find that a certain image order results in a much higher conversion rate than another. For buyers unconvinced by your title and images, your bullet points are your next opportunity to seal the deal. Amazon’s bullet points are relatively straightforward. You have five spaces for bullet points, but that does not mean you are limited to five words or even five sentences. To maximize the use of your bullets, use a short paragraph of two to four sentences and focus on the features and benefits of your product. Address any common questions or objections that might cause someone not to buy. Remember to update these often! If you get complaints in your reviews that come simply from a misinterpretation of the product, update your bullets (and maybe even your title) to account for that. Using all caps for the beginning of your bullets can help you to emphasize key points. Note that Amazon does not allow a ‘Seller Warranty’ but does allow for a ‘Manufacturer’s Warranty’ to be included in a listing. Amazon offers all buyers protection under its A-Z Guarantee program, which all sellers are required to abide by and honor. The product description area is perhaps your last chance to turn a shopper into a buyer on your Amazon listing. Despite its importance on independent webstores, the product description is often overlooked by Amazon shoppers. This might be because of its location on the page: Buried toward the bottom and without any pomp and circumstance to draw attention. You should use basic HTML markup, if possible, to highlight certain words or phrases, and to make your description easier to read, as opposed to a paragraph all lumped together. Amazon no longer allows other forms of HTML in the product description or any other areas of an Amazon listing. Enhanced Brand Content, previously reserved only for products sold by Amazon, and those sellers in the Vendor program, is now available for most sellers through Seller Central. This exciting new program allows sellers to greatly enhance the Product Description section of their listing with additional photos, copy and even comparison charts. As of the date of this publishing (December 2018), Enhanced Brand Content detail pages are available at no additional cost to sellers. I highly recommend taking advantage of them. You can use one of five pre-built templates for your Enhanced Brand Content, or select the customer template and use individual modules to create the style you desire. Here are two examples of Enhanced Brand Content. Reviews impact an Amazon product listing in three ways and should be one of your top marketing considerations. First, reviews impact product listing placement through the average star rating that appears alongside the product in search results and at the top of the product detail page. A product with an average star rating of 4 or 4.5 stars will typically outperform a similar product with only 3 or 3.5 stars. In 2015, Amazon transitioned to a weighted system for measuring a product’s average star rating. Whether a product is bought at a discount. How long ago the review was left. How helpful other Amazon shoppers say a review is to them. You can make the most of your average star rating by focusing on courting organic reviews from customers who pay full price for your product. 2. Most Popular Reviews Section. The Most Popular Reviews section, which is located toward the middle of the page on the left-hand side, is the area where reviews for the product that have been voted ‘Yes” as helpful most often. Sellers cannot dictate which reviews show up in this section. Customer votes, whether they have purchased the item or not, can affect which reviews show up here. Typically, the more 4 and 5-star reviews that appear in this section, the higher the conversion rate and sales will be, while the more 1 to 3-star reviews that show up, the lower the conversion rate and sales will be. HAVE YOU REVIEWED THE THREE WOLF MOON TEE? The Mountain is proof that people don’t have to buy your item for reviews to boost your ranking. In 2008, a college student left a satirical review on the brand’s Three Wolf Moon T-shirt. Since then, 40,000 people have said the review was helpful. The Mountain is a now a multi-million dollar brand. 3. Most Recent Customer Reviews. The final place that reviews impact a listing are in the ‘Most Recent Customer Reviews’ section, which is located towards the middle of the page to the right. This section includes the ten most recent reviews, and cannot be impacted by votes of any kind. The only way for a review to move out of the most recent section is for more reviews to be left for that product, replacing it. To maximize your chances for successful selling on Amazon, pay close attention to your reviews. Sell a quality product, treat your customers well, take care of issues promptly when they arise and always go above and beyond. You can comment on reviews as the seller, and many buyers appreciate a seller that is proactive about addressing issues and providing an exceptional customer experience. Perhaps the most underutilized marketing opportunity of an Amazon product listing is the Questions & Answers section. Questions are submitted by customers, whether they have purchased the product or not. A unique feature is that the answers to these questions can be submitted by both other customers (again, whether they have purchased the product or not) or by the seller. Many sellers assume that they must simply sit back and wait until customers start asking questions for this section to be utilized. Instead, consider seeding the section by asking a colleague or friend to put a question that is common for your product, so that you can answer it. Once questions are asked, make sure that the answers displayed to those questions are accurate. If multiple answers are provided by either customers or sellers, Amazon displays the answer that has the most votes. Votes are submitted by either clicking on the “up” or “down” arrow next to the answer. Because anyone can submit an answer, you will want to keep an eye on this section and ensure that the answer displayed for a question is correct. In addition to pulling from a title and bullets, Amazon determines which keywords are relevant for your listing from the Search Terms section, which is located in the back-end of seller central. This section is not visible to the public. In 2017, Amazon began truncating the back-end search terms to the first 250 characters. That is to say that only these characters are “indexed,” and show up in search results. Because of this, it is now extremely important to make sure your first 250 characters in the Search Terms field are the most relevant to your product listing. You do not need a comma between words, but you do need a space. Do not repeat words, or make sentences out of your keywords. For example, once you use the word ‘dog,’ there is no need to repeat that word anywhere else in the search terms section. You’ll know you are on the right track if you end up with a search terms section that is not cohesive, meaning there are no complete sentences; it should seem like a jumbled up mess of related words. We’ve covered a lot of ground, and laid the groundwork for a great product listing — and marketing plan — on Amazon. It’s important, however, to note that a well-performing listing is part science and part art. Testing is imperative to make sure you are maximizing the opportunity. When testing, make small changes and give adequate time to measure the impact of those changes so that you know whether to keep them or to revert to the previous version of your listing. If possible, test only one element of your listing at a time. If you test multiple items at once, you will not know which change impacted your listing, however positive or negative the impact. There are a lot of critical elements to a product’s success or failure on the world’s largest ecommerce platform. Your listing is certainly a major one, and by following these simple steps, you are well on your way to an optimized and high-converting listing. Chapter 2 Is Your Business a Good Fit for Amazon? Kevin Rizer is a former corporate worker and current private label Amazon seller, consultant and the founder of Private Label Podcast. His Amazon business features 3 products and does nearly $100,000 per month in gross sales. His Private Label Podcast covers changes and trends in the industry, and in-depth interviews with successful private label entrepreneurs.